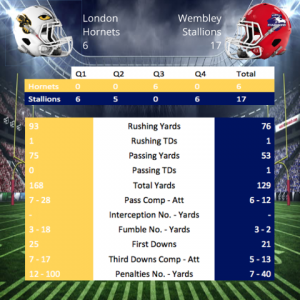 In a hard fought battle, Wembley Stallions took a two-possession lead into halftime. Tension rose as the home side, London Hornets came back into the game, but the Stallions increased their lead again to gain their first win in Division One SFC East. Sunday marked the end of a two-year wait for the Stallions to face off against their rivals, the Hornets, as they travelled to Mill Hill. The Stallions started the first drive after the Hornets won the coin toss and deferred to the second half. However, pressure on quarterback Lawrence Wild lead to failed pass attempts and a quick three-and-out. The home side started with great field position on the Stallions 32-yard line. They began by running the ball in their opening couple of plays, tackles from Henry Young, Duncan McAslen and Johann Johnson stopped them at the red zone. There drive stalled after a failed pass attempt and two penalties pushed them back. An attempt at a field goal fell short into to the arms of Stallions’ Young who took a knee to put the away side’s next drive at the 20-yard line. The away side showed off their returning game, Junior Ejehu gave the Stallions a new set of downs. 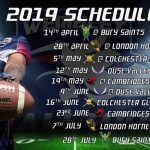 Then Chaki Smith moved the away side close to mid-field, a penalty on the defence added ten-yards to the end of the run putting Wembley on the Hornets’ 42-yard line. However, two penalties for false starts and a sack gave Ejehu to much yardage to move the sticks, so the punt team were sent on. The Hornets mixed up the plays, starting with a failed pass attempt then the run play. Another penalty on the offence pushed them back rather than moving the sticks. But a missed tackle on the next play extended the home side’s drive; before Kyle Purewal stopped them midway into Stallion territory. Martin Dwamena piled pressure on the quarterback, halting his progress back at the line of scrimmage. A failed pass and a tackle from Paul Fergus pushed the Hornets back. Pressure showed on fourth, with a high snap forced the punter to scramble, but mass pressure and a stop by Lacean Christie gave the Stallions great field position on the Hornets’ 35-yard line. Stallions returned to the running game, swapping between Ejehu and Smith to put the away side close to the red zone. A throw on third found Nick Glenday in double coverage on the three-yard line. A short running touchdown by Ejehu put the away side in front, but a mishap on the snap prevented the extra point being tried, meaning the Stallions lead was 0-6. The away side kept the pressure on the Hornets in their next drive. Johnson tackled the runner for just a short gain. Then Chris Hinton put pressure on the quarterback, who pass attempt failed due to McAlsen’s tackle on the receiver. Another failed pass attempt sent the punt team on after a quick three-and-out. The Stallions received the ball on the 19-yard line as clocked expired in the first quarter. After switching ends the away side returned to the running game, Ejehu and Smith shared the load as they moved the sticks. However, a delay of game and a failed pass attempt left Ejehu too much to do and the punt team returned to the field. The home side were unable to move up the field on their next drive. 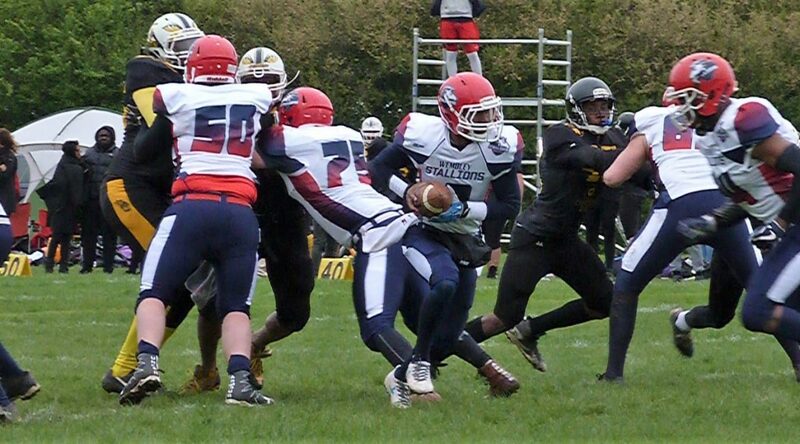 Hinton made a tackle out in the flat to pushed the Hornets back, whilst Johnson tipped the ball at the line causing the pass attempt to fail. Luke Streeter added more problems causing a fumble on fourth down, leading the away side to takeover just five-yards from the end zone. The Stallions’ offence was unable to capitalise on the great scoring opportunity, fumbling the ball at the line of scrimmage. The Hornets recovered the ball to keep the game at just one score. The Stallions’ defence kept up the pressure and after a failed pass attempt on first, Purewal tackled the quarterback in the end zone resulting in a safety. Making the score 0-8. From the kick off Aaron Greenidge ran for 35-yards to put the away side into Hornets’ territory, a penalty on the home side added more yards, putting the Stallions at the 14-yard line. A bad snap put the away side in trouble, but Ejehu was able to recover the ball back on the 28-yard line. 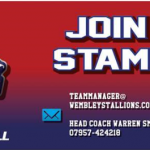 Junior Price in at quarterback ran on second down to return the offence to the 14-yard line, but a false start penalty on the next play pushed the Stallions back again. A failed pass attempt on third down meant the field goal unit was sent out. Glenday made the field goal to extend the Stallions lead at 0-11. The Hornets didn’t fair any better in their next drive, with tackles from Young and Sam Fraser ensuring the home side couldn’t move down the field and a quick three-and-out. The Stallions could have started their next drive within the Hornets’ territory, but offsetting penalties meant the punt had to be retaken. The away side from midway in their half, suffered a quick three-and-out. A loss on a throw out wide to Glenday, a failed long pass to Krystian Czadowski in double coverage and a sack pushed the Stallions back and the punt team on. The Hornets punt returner set up their offence just outside the red zone, but again were unable to move the ball thanks to tackles from Streeter and Hinton halting their progress. Another failed pass attempt meant a turnover on downs putting the Stallions back on the field to see out the second quarter with the score 0-11. A penalty on the home side started off the third quarter, pushing their opening drive back to the 24-yard line. The Hornets stuck with the running game, but with tackles from McAslen kept the home side at minimal gains. Keeping with the run game worked as they moved the sticks, something they had not achieved since the first quarter. A big run marched the Hornets over halfway before the drive stalled. With tackles from McAslen and Fergus keeping the run game under warps and penalties for false starts, the Hornets had to punt the ball away. A good punt from the home side had the Stallions back at their own ten-yard line. A couple of runs from Daven Abrahams were stopped with no gain, before a throw with an acrobatic catch from Carl James was just short of a new set of downs. A penalty on fourth pushed the away side back leading to great field position for the home side from the resulting punt. After not capitalising from great field position earlier in the game, the Hornets did not let this opportunity slip away. They were quickly into the red zone, where a tackle by Danny Hounslow and a failed pass attempt only delayed the home side getting points on the board, as they ran in for a touchdown. An attempt at a two-point conversion failed as pressure from McAslen and Brett Parnham got to the quarterback, making the score 6-11. Boosted by their score, the Hornets put pressure on Czadowski on the kick return, causing a fumble and setting themselves back within the red zone and a chance to score again. The home side mixed up their plays starting with a pass, Young made a tackle to stop a new set of downs, but the Hornets were able to run the ball on the next play. Setting them up at the five-yard line. McAslen put in a score saving tackle, before the pressure mounted. A low snap gave the Stallions defence the chance to push the Hornets back. A failed pass of third set up fourth-and-goal on the five-yard line. The home side faked the field goal attempt and instead tried to go for a touchdown. Parnham was ready, making the tackle back at the 24-yard line for the Stallions to maintain the lead and take over on downs. The momentum of the game should have switched back to the Stallions, but Ejehu fumbled the ball on the next play, gifting the Hornets back possession and great field position. The home side returned to mixing plays, starting with the run game then throwing. A tackle from Glen Trafford-Smith halted their progress as the third quarter ended. The Hornet’s quarterback kept the ball at the start of the final quarter to seek for another set of downs. But a fumble snap and a penalty for delay of game pushed the home side back. More pressure on the quarterback, this time from Dwamena and Hounslow prevented passes to be completed on second and third down. The Hornets went for it again on fourth down, but were spoiled again by Parnham, giving the possession back to the away side at the 30-yard line. The Stallions returned to their running game with Ejehu and Greenidge, but were unable to move the sticks. The punt team were sent out after a quick three-and-out. The home side returned to the running game, but McAslen made another tackle on the running back to prevent any gains. A completed pass got the Hornets over midway; but a tackle by Luke Johnson kept the Hornets out of the red zone. The drive then stalled after Trafford-Smith prevented a pass being completed and a sack by Fergus lead to the punt team being sent on. Wild returned to quarterback for the away side. 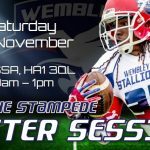 After a scramble run on first down Wild threw the ball, James tipped the ball into the hands of Czadowski for a 14-yard gain, followed by a run from Hounslow moved the Stallions over halfway. More runs from Abrahams and Smith and a catch by Parnham continued the drive. However, the punt team were sent on after the drive stalled when the away side were pushed back on Abrahams and Ejehu runs and a pass was nearly intercepted. The Stallions’ defence continued the pressure on the Hornets’ quarterback, this time from Hounslow and McAslen before Dwamena forced the running back to fumble, which McAslen recovered, returning the away side back on the field in great field position. The away side lost ground on an Ejehu run and further still from a penalty for a false start. But a throw found Czadowski who got into the end zone for a touchdown and restored the Stallions two possession lead. The extra point was kicked wide to make the score 6-17. With time running out the Hornets pushed for a quick score. Throwing for 23 yards, Trafford-Smith put in a tackle to stop the receiver midway into Stallions’ territory. Keeping the tempo up, the home side quickly gained a new set of downs, with Andis Mema putting in a tackle to stop the receiver at the red zone. The Hornets’ drive then halted with McAslen tipping the ball to prevent a completed pass and a penalty for holding pushed the home side back. On their final play more pressure on the quarterback by Hounslow caused another pass to fall to the ground. The Stallions returned to the field to take a knee in victory formation, finally beating their rivals 6-17.